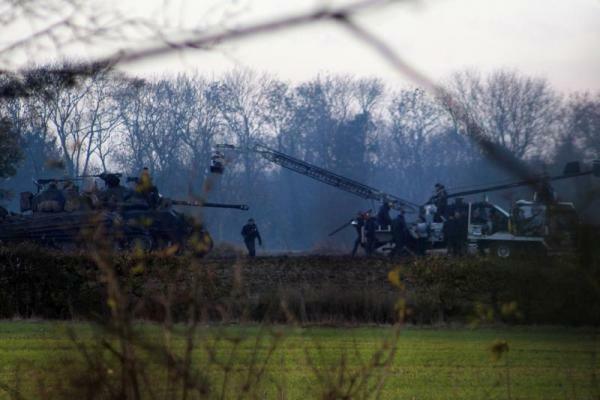 Last November Delta Force Paintball had the pleasure of watching Brad Pitt and Shia LaBeouf as they filmed scenes for WWII based Fury, the latest Hollywood blockbuster from legendary director David Ayer. The film follows the crew of an M4A3E8 Sherman tank as they embark on a deadly mission behind German enemy lines in 1945 Nazi Germany. Filmed a stone’s throw from our Paintballing centre in Hemel Hempstead, Hertfordshire, our guests were afforded a great view of the action as Pitt, LaBeouf and fellow co-stars, Logan Herman, Scott Eastwood, Jason Isaacs, Michael Pena and Jon Bernthal shot several scenes for the upcoming WWII war epic. Sadly on this occasion Pitt’s filming schedule kept him away from a day of paintballing action at Delta Force, but we would absolutely love to see him at one of our paintball centres in the future. As avid fans of paintballing Brad Pitt and wife Angelina Jolie have talked openly in the past about having a paintball themed wedding. Whether or not this actually happened is still shrouded in blanket of well deserved secrecy. Whilst we’re on the subject of Hollywood stars, here are a few other well known faces that we would love to see at a Delta Force paintball centre in the future. Known as the action man of Hollywood, Gyllenhaal starred in blockbuster films such as Donnie Darko, Source Code and Jarhead. He also conquered his fear of heights in 2011 as a special guest of Bear Grylls on hit show Man vs. Wild. During the episode Gyllenhaal crossed an expansive ice gorge, with a sheer drop to the bottom, aided by a rope and no safety line. Armed with nerves of steel Gyllenhaal would have no problems at a Delta Force paintball centre, unless of course Frank the rabbit turned up and distracted him! Needing little introduction Arnold Schwarzenegger has been a household name for generations now thanks to his portrayal of the Terminator – an almost indestructible cybernetic warrior sent from the future. In the movies the Terminator is relentless in the pursuit of his targets and rarely misses a shot. In real life however Schwarzenegger is the former governor of California, proving that he is more than just a pretty heavily muscled face. Welcoming Arnold Schwarzenegger to a Delta Force paintball centre would make a lot of people happy – except of course, our resident paintballing Terminator – who has been fearing a visit from Arnold (or his lawyers) ever since he was chased by a liquid metal Terminator in a shopping centre in 1991. Viewed by many as the most beautiful woman in the world, it’s only fair that we include the wife of Brad Pitt in an article that would be otherwise dominated by Hollywood’s macho men. Angelina isn’t just known for her looks though, she’s also every bit the action hero as any of the guys on this list – having starred in smash hit movies such as Gone in 60 Seconds, Mr and Mrs Smith (alongside hubby Brad Pitt) and of course, video game inspired action adventure movie, Tomb Raider. We think Angelina Jolie would look great on a Delta Force paintball gamezone. If only we could make an exception to the safety rules and skip out on the full length combat suit and full head goggles – but sadly we cannot. Besides, Angelina would already have too much of an advantage playing paintball on our Tomb Raider game zone, for obvious reasons! There are many other stars and celebrities that could be added to this list, but for now, Delta Force would like to extend an open invitation to the above to come down and join the hundreds of thousands of other players that choose us for their paintballing day. Don’t miss out on your paintballing experience, book now with Delta Force by calling: 0203 869 9301 – 24 hours a day 7 days a week.